WEBSTER VENTURES, LLC, v. SHARON A. MCCORMICK, GAIL C. BROCHU, LINDA JENESKI, MOHAMED JABER, ANNETTE T. CRIASIA, SUZANNE J. VALLEE, JOSEPH J. WOODMAN, III and BARBARA J. WOODMAN, LEE J. PARKER, LINDA C. CHAMBLESS, TRUSTEE OF THE LAKEVIEW ROAD IRREVOCABLE TRUST, CYRILLA SROKA, FAITH D. RUBIN, HENRY E. HOPKINS and LORI J. HOPKINS, CHAD R. STAWIECKI, TRUSTEE OF THE ROBERT STAWIECKI IRREVOCABLE TRUST, JEREMY T. STAWIECKI, TRUSTEE OF THE ROBERT STAWIECKI IRREVOCABLE TRUST, EMANUEL J. LEO and LINDA J. LEO, J. TERRENCE SULLIVAN and NANCY SULLIVAN, MARK H. BROOKS and LINDA A. CROTEAU-BROOKS, MORTGAGE ELECTRONIC REGISTRATION SYSTEMS, INC., BANK OF AMERICA, N.A., THE CADLE COMPANY, ASSIGNEE OF FEDERAL DEPOSIT INSURANCE CORPORATION AS RECEIVER OF HOME NATIONAL BANK OF MILFORD, COMMONWEALTH NATIONAL BANK, MILFORD FEDERAL SAVINGS AND LOAN ASSOCIATION, NATIONSTAR MORTGAGE, LLC, SECRETARY, UNITED STATES DEPARTMENT OF HOUSING AND URBAN DEVELOPMENT, UNIBANK FOR SAVINGS, UNION CAPITAL MORTGAGE BUSINESS TRUST, U.S. BANK NATIONAL ASSOCIATION, as Indenture Trustee for the CIM TRUST 2016-FRE1, MORTGAGE-BACKED NOTES, SERIES 2016-FRE1, WEBSTER FIRST FEDERAL CREDIT UNION, TD BANK, NA, TOWN OF WEBSTER, PENNYMAC LOAN SERVICES, LLC, MAUREEN E. DUFFY, DONALD FARQUAR, INTERCONTINENTAL CAPITAL GROUP, ROBERT A. MARTELL, CAMBRIDGE MORTGAGE GROUP, CRAIG HANFORD, LAURA HANFORD, PAUL SWENSON, TRACEY SWENSON, MACKINAC SAVINGS BANK FSB, BRUCE FINLEY, USAA FEDERAL SAVINGS BANK, DYLAN BROWN, and LOANDEPOT.COM LLC. MEMORANDUM AND ORDER ON DEFENDANTS' MOTION TO STRIKE AMENDED COMPLAINT. In its Memorandum and Order on Defendant's Motion for Summary Judgment (Memorandum and Order on Summary Judgment), dated December 16, 2016, and incorporated herein, the court found that the Lakeview Road Defendants (as defined in the Memorandum and Order on Summary Judgment) have easements by estoppel and by implication to use Lakeview Road, in Webster, Massachusetts, for its entire length, as shown on a 1924 plan, but do not have the right to use the way to access the abutting Indian Ranch Property. Thereafter the parties engaged in protracted settlement negotiations over an agreement for judgment to resolve their rights in the subject easements. In connection with a proposed agreement for judgment the Lakeview Road Defendants consented to the filing of a Second Amended Complaint in April 2018. The Second Amended Complaint included a claim for the relocation and narrowing of the easements in Lakeview Road which was to be a part of the settlement. Negotiations have broken down and this action is no longer progressing to settlement. Webster Ventures, LLC now wishes to litigate the claim in the Second Amended Complaint for the modification of the easements and the Lakeview Road Defendants seek to strike the Second Amended Complaint. The procedural history set forth in the Memorandum and Order on Summary Judgment is incorporated herein. The Motion to Substitute Mortgagee Party-In-Interest was filed on February 23, 2017, and was allowed, substituting U.S. Bank National Association, as Indenture Trustee, for the CIM Trust 2016-FRE1, Mortgage-Backed Notes, Series 2016-FRE1, for Washington Mutual Bank FA, on March 2, 2017. The Motion of Sharon McCormick, Joseph and Barbara Woodman, Stephen and Mary Magnuson, Linda Chambless, Cyrilla Sroka, and Faith Rubin for Entry of Final Judgment was filed on April 11, 2018. The Plaintiff's Motion to Amend Complaint was filed on April 13, 2018. The Second Amended Complaint (Second Am. Compl.) was filed and the Motion to Amend Complaint was allowed on April 18, 2018. The Consent to Plaintiff's Motion to Amend Complaint was filed on April 19, 2018. The Motion to Dismiss Second Amended Complaint was filed on May 9, 2018. The Stipulation of Dismissal as to Nominal Defendant U.S. Bank National Association, as Indenture Trustee was filed on May 23, 2018. The Lakeview Road Defendants' Opposition to Form of Judgment Proposed by Webster Ventures, LLC was filed on May 24, 2018. The Request for Default pursuant to Mass R. Civ. P. 55(a) on Defendant Intercontinental Capital Group, Inc., Maureen E. Duffy, Tracy Swenson, Dylan Brown, Bruce E. Finley, Laura Hanford, Craig Hanford, Robert A. Martell, Mackinac Savings Bank, Loandepot.com LLC, Donald Farquhar, Paul Swenson was filed and the named defendants were defaulted pursuant to Mass. R. Civ. P. 55(a) on June 21, 2018. The Lakeview Road Defendants' Opposition to Motion to Amend Complaint, or in the Alternative, Motion to Strike Second Amended Complaint; and Request for Sanctions was filed on July 18, 2018. The Stipulation of Dismissal as to Nominal Defendant Bank of America, N.A. was filed on October 11, 2018. The Plaintiff's Opposition to Defendants' Motion to Dismiss or Strike Second Amended Complaint was filed on October 15, 2018. The Lakeview Road Defendants' Consolidated Memorandum Opposing Motion to Amend Complaint, Supporting Motion to Strike Second Amended Complaint, Opposing Plaintiff's Proposed Form of Judgment and Requesting Sanctions and Affidavit of James C. Donnelly, Esquire (Donnelly Aff.) were filed on October 18, 2018. On October 24, 2018 the Lakeview Road Defendants' Reply to Plaintiff's Opposition to Motion to Dismiss or Strike Second Amended Complaint was filed and the pending motions were taken under advisement. This Order follows. Before the court are the Lakeview Road Defendants' Motion for Entry of Final Judgment and Opposition to Motion to Amend Complaint, or in the alternative, Motion to Strike Second Amended Complaint; and Request for Sanctions. [Note 1] The Plaintiff's Motion to Amend Complaint was allowed and the Second Amended Complaint was filed on April 18, 2018. Because the Lakeview Road Defendants only consented to the amendment to facilitate settlement and the entry of final judgment and Webster Ventures now seeks to actually litigate the counts added to the Second Amended Complaint, the court considers the Lakeview Road Defendants' Motion to Strike Second Amended Complaint under the same standard as a motion to amend a complaint. For the reasons discussed below the Motion to Strike Second Amended Complaint is allowed and the Second Amended Complaint is struck. As the parties have reported that they are unable to negotiate a settlement, final judgment shall enter consistent with the Memorandum and Order on Summary Judgment. Leave to amend a pleading "shall be freely given when justice so requires." Mass. R. Civ. P. 15(a). "The decision whether to grant a motion to amend is within the discretion of the judge, but leave should be granted unless there are good reasons for denying the motion." Mathis v. Massachusetts Elec. Co., 409 Mass. 256 , 264 (1991). "Reasons for denying such a motion are undue delay, bad faith or dilatory motive on the part of the movant, repeated failure to cure deficiencies by amendments previously allowed, undue prejudice to the opposing party by virtue of allowance of the amendment, futility of the amendment, etc." Manfrates v. Lawrence Plaza Ltd. Partnership, 41 Mass. App. Ct. 409 , 413 (1996) (internal citations and quotations omitted). In light of the conclusions of law in the Memorandum and Order on Summary Judgment, the claims set forth in the Second Amended Complaint would be futile as this court could not grant the relief that Webster Ventures seeks. Jacob v. Jacob, 9 Mass. App. Ct. 864 , 865 (1980). At the outset of this action Webster Ventures sought a declaration that no persons have any rights to use the northern end of Lakeview Road where Webster Ventures owns all of the lots on both sides of the road. In the Memorandum and Order on Summary Judgment, the court found, in part, that the Lakeview Road Defendants have an easement by estoppel and an implied easement for the use of Lakeview Road for the entire length of the way, as indicated and prescribed in a plan of land entitled "Map No. 1, La Vue Du Lac, Purdy & Becker, Webster, Mass." dated May 1924, and recorded with the Worcester Registry in Plan Book 42, as Plan 38 on June 2, 1924 (1924 Plan). The 1924 Plan is attached for reference at Exhibit A.
Webster Ventures seeks to build condominiums on the contiguous lots it owns on Lakeview Road. Local land use regulations require that the condominiums all be situated on one, undivided lot. Donnelly Aff. ¶ 13. 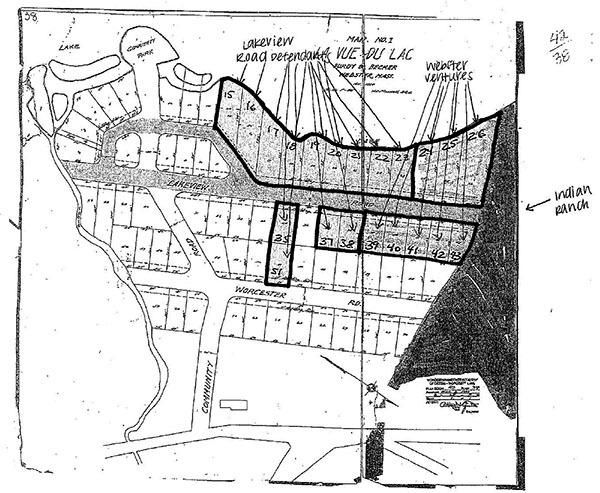 As the lots Webster Ventures owns are bisected by Lakeview Road it is unable to develop its land as a single parcel. Having failed to establish that no other parties had rights in the disputed portion of Lakeview Road, Webster Ventures now seeks, by the claims added in the Second Amended Complaint, to relocate the Lakeview Road Defendants' easement in the manner prescribed in M.P.M. Builders, LLC v. Dwyer, 442 Mass. 87 (2004). 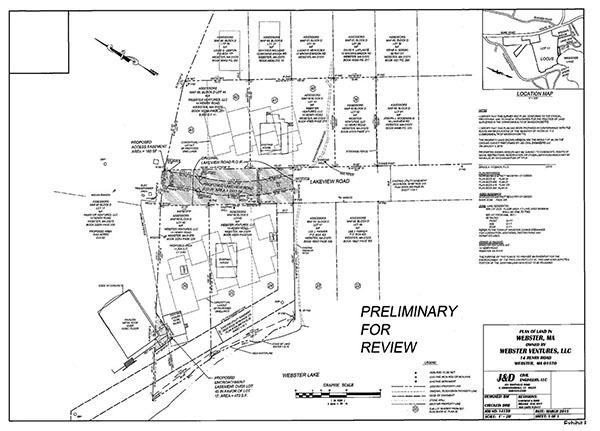 The Second Amended Complaint seeks "an Order declaring that the Plaintiff may relocate a portion of Lakeview Road in which the Defendants claim a right of way to the area designated as 'Proposed Lakeview Road' as shown on a survey plan entitled 'Plan of Land in Webster, MA 01570,' by J & D Civil Engineers, LLC dated March 2015 and revised June 2017 and September 29, 2017 [(Survey Plan)], and declaring that the rights of any person having rights on the affected portion of Lakeview Road are relocated to the area designated as "Proposed Lakeview Road" as shown on said plan." A copy of the Survey Plan is attached as Exhibit B. Second Am. Compl. p. 14 & Exh. B. A review of the proposed relocation of the Lakeview Road Defendants' easement shows that Webster Ventures seeks to narrow the road from 40 feet to approximately 10 feet and to abandon the northerly ten feet so that it no longer extends all the way to the Indian Ranch Property. [and] frustrate the purpose" of the easement by estoppel, Id. at 91-92, by materially altering the rights of the Lakeview Road Defendants to traverse the full length of Lakeview Road. Webster Ventures cannot avail itself of the process under M.P.M. Builders to reduce or limit the Lakeview Road Defendants' easement. For this reason alone Webster Ventures has not plead a claim for which this court could grant the relief sought. Further, the easement at issue in M.P.M. Builders was a recorded easement, not an easement by estoppel or an implied easement. This court is unaware of any cases since M.P.M. Builders, which have applied the right of a servient estate owner to relocate an easement, to the relocation of an easement by estoppel or an implied easement. Unlike other easements, which may grant another the right to cross over the middle of the servient estate, easements by estoppel and implied easements are predicated on the existence of a way, of which the servient estate owner holds the fee either expressly by deed or by operation of the derelict fee statute, G.L. c. 183, § 58. An easement by estoppel or an implied easement already grants the benefitted estate owner the least obtrusive easement possible in that the burdened way is almost necessarily situated on the edge of the servient estate. Here, Lakeview Road runs along the lots owned by Webster ventures. The Lakeview Road Defendants' easement by estoppel and implied easement gives them the right to make use of Lakeview Road for its entire length. The purpose of that easement would clearly be frustrated by allowing Webster Ventures to discontinue the northerly ten feet of the way (even if there remained a more limited easement right) for the purpose of recombining lots which were created in 1924. The relief sought by Webster Ventures in the Second Amended Complaint would require this court to find that where a single party owns land on both sides of a road which serves as a right of way for others benefitted by an easement by estoppel or an implied easement, the ownership of that land gives the servient estate owner the right to seek to modify or extinguish the easement under M.P.M. Builders. This conclusion would be directly in conflict with the presumption that a deed which describes a property as bounded by a way shown on a plan also conveys an easement for the use of the entire distance of the way as shown on the plan. Goldstein v. Beal, 317 Mass. 750 , 755 (1945). Any servient estate owner could then seek to reduce the width of a way or discontinue it entirely by arguing that doing so meets the criteria adopted in M.P.M Builders. While the owner of land abutting a road can certainly seek to partially extinguish some of the width of the way through other means, the relocation and modification of easements contemplated by the SJC in M.P.M. Builders only allows for such changes as do not materially alter the benefit granted to the easement holder. It is unclear that the relief sought by Webster Ventures is available under M.P.M. Builders. Further, even if this court could issue a declaration decreasing the length of the Lakeview Road Defendants' easement by estoppel or implied easement, to do so would almost certainly frustrate the purpose of the easement by altering a road, which exists on the ground, in a way that decreases the benefit to the easement holders solely for the benefit of Webster Ventures. The result that Webster Ventures seeks may be available through settlement with the Lakeview Road Defendants. It seems unlikely, however, that there is a legal remedy that will achieve the resolution that Webster Ventures seeks. The First Amended Complaint was filed to adjudicate the interests of the parties in Lakeview Road. Those rights were adjudicated in the Memorandum and Order on Summary Judgment that issued over two years ago. While the delay in entry of judgment resulting from settlement negotiations has not prejudiced the rights of any of the parties, allowing the litigation of the Second Amended Complaint where this case is ripe for judgment would be inappropriate, particularly where the relief sought by Webster Ventures is likely unavailable as a matter of law. As there is no chance of prejudice to Webster Ventures, justice does not require that the claims in the Second Amended Complaint be allowed to go forward. For these reasons the Second Amended Complaint must be struck and final judgment must enter. The striking of the Second Amended Complaint is without prejudice to any of the claims asserted therein and this court does not purport to have reached any binding legal conclusions in its determination regarding the present futility of Webster Ventures' claims added in the Second Amended Complaint. It does not appear that the extended and ultimately unsuccessful settlement negotiations have prejudiced the Lakeview Road Defendants or were the result of bad faith by Webster Ventures. As such, the Lakeview Road Defendants' request for sanctions and attorney's fees must be denied. The Plaintiff's Motion to Amend Complaint filed on April 13, 2018, and allowed on April 18, 2018, also sought, by way of the Second Amended Complaint, to substitute existing parties to reflect successors in interest to the originally named parties and mortgagees holding interests in the subject properties acquired after the commencement of this action. While the Second Amended Complaint must be struck, the court considers the Plaintiff's Motion to Amend Complaint as a motion to substitute parties which was allowed on April 18, 2018. Maureen E. Duffy, Donald Farquar, Intercontinental Capital Group, Robert A. Martell, Cambridge Mortgage Group, Craig Hanford, Laura Hanford, Paul Swenson, Tracey Swenson, Mackinac Savings Bank FSB, Bruce Finley, USAA Federal Savings Bank, Dylan Brown, and Loandepot.com LLC were substituted for Herbert Dumore, Rose Dumore, Fredrick Cronin, Stephen P. Magnuson, Mary A. Magnuson, Ray A. Cull, Shelley Solomon Cull, Adam Stawiecki, Ally Bank Corporation f/k/a GMAC Bank, People's Savings Bank, Easthampton Savings Bank, Ross Mortgage Co., Inc., Santander Bank, N.A., Washington Mutual Bank, FA, and Portfolio Recovery Associates, LLC. Those substituted parties were served with the Second Amended Complaint, and some of them were defaulted on June 21, 2018. As the Second Amended Complaint it struck, the entry of judgment shall include a dismissal of all claims against the substituted parties without prejudice. For the foregoing reasons, the Defendants' Motion to Strike Amended Complaint is ALLOWED. The Defendants' Request for Sanctions is DENIED. The Defendants' Motion for Entry of Judgment is ALLOWED IN PART AND DENIED IN PART. The Judgment shall enter consistent with the Memorandum and Order on Summary Judgment and this Order. [Note 1] Additionally, a Motion to Dismiss Second Amended Complaint was filed by an individual, Laura Gaudette, who is not a party to this case. The disposition of the motions to strike and for entry of judgment moots this non-party filing.